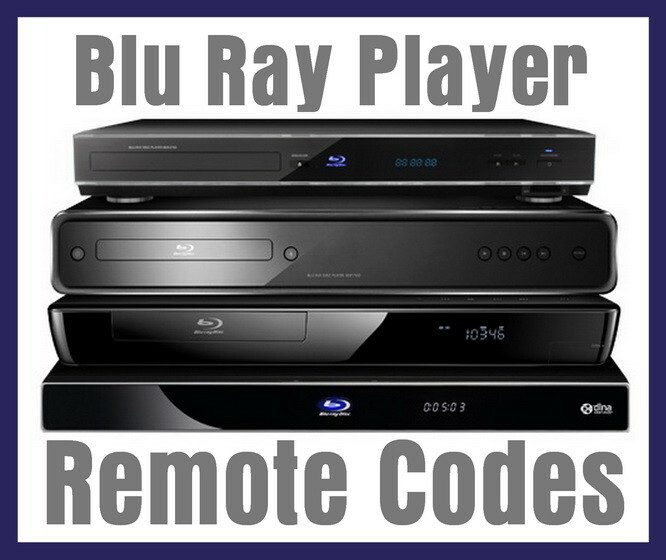 Looking for remote codes for your Blu-ray Player? Here is the list with the KNOWN working device codes for all Blu-Ray DVD players. These should work with ANY remote as these remote codes are universal. If these 4 digit blu ray player remote codes did not work on your blu-ray player, please leave a comment below and we will find you the correct remote code. I have a Yamaha RX-V550 receiver with a RAV254 Yamaha remote, and I need a 4 digit remote code for a Sony BDP-S570 Blu-Ray/DVD player that’s compatible with that equipment. Thanks! I desperately tried several remote codes for my Humax Rm-e06. I tried to find a 3 Digit code for my Blueray player : BD-J4500R (Samsung). Can you help me to find the right code? I cannot find the GE remote code for a Sony Bluray/DVD player. Manual code search also failed. I had it programmed correctly once but did not write it down. Also, not sure if I use DVD or Blu-ray as device. I have a Magnavox Blu-ray/DVD player. The serial number is J25358977 and the model number is MBP5320/F7H. I’m trying to program it to a Vizio TV remote – not necessarily a universal. I been trying to program my universal remote to my insignia blu-ray DVD player. I’ve tried every code and nothing seems to work. I don’t know if it’s the DVD player or if it’s my remote. I need a 5 digit code for the LG lhb655. I have a Philips CL015 universal remote. I am trying to program a Samsung bluray player. Should I be trying to program the code under the VCR button? Please let me know which code to use. I need Toshiba bdx2150 Blu-Ray Player remote codes. Need code for Seiki SRS212S blu ray/dvd player. I have a GE UltraPro universal remote. I tried both JVC and Panasonic codes for my JVC blu-ray XV-BP10 and neither seem to work. Trying to connect my Sharp blu-ray 3d player model BD-HP35 to my 40.0 dish network controller. I have a samsung blu ray player and the Toshiba codes given didn’t work… Unless I’m not doing the syncing process right? I have a Dynex dvd/blu-ray player, model # DX-wbrdvd1, serial # 11H102929, manufactured Aug 2011. I need to know if u can program the player either to my cable spectrum remote or to a universal replacement remote. I have an iVid blu ray player with a GE remote. I cannot find a code anywhere for this remote. I have a Philips RC122 remote and a Sony BDP-BX2 Blu-Ray Player. I can’t seem to find the correct code to make my remote control the Blu-Ray. Any suggestions? And as well the code to use for HUMAX sat reciever on Herman kardon remote controll. The Herman kardon is a 1515s set. My universal remote (philips) didn’t work with my blu rad dvd player (samsung). I bought another universal remote (diamond vision) and still not working. Though the first remote (philips) works for my TV. What should i do? The codes listed for the JVC xv-bp1 DVD player do not work. If you can find it I would be very appreciative. Need help finding a four digit code for the LG Blu-Ray Player BD530. Need codes for a RCA blu ray home theater RTB1023. I have a GE remote control. I have Samsung TV remote BP59-00107A and am having trouble pairing it with Samsung Blue Ray BD-E6500. Thanks in advance for your help! None of the Denon codes work with the GE remote, haven’t found one online that works yet, older TVs and Blu rays and DVDs don’t seem to work on the cheap GE remote from Walmart, only code I have found to work with it is the Samsung curve tv. Panasonic blu-ray dmp-bd65 on the UNIVERSAL Remote – 4 devices. Need 3 digit remote code for Sony blu ray player BDPS580 which has Sony remote RMT-B109A. Trying to program universal remote from my cable supplier. 3 Digit Remote Control Codes for Sony Blu-Ray Player are 516, 617, 644, 670, 729, or 241. I’m needing codes for an HP bd-2000 Blu-ray player for a ge universal remote model 7252 I believe. I have tried manual codes and code search with the remote but nothing is working. I have a Denon Blu ray player and the GE 11695 cl3 1547 remote, tried 6051 and dozens others. I have a universal remote control. I need help for philips hts3306 f7. I need the region free code for this machine as well. None of the code a worked with my universal remote at all for the blue ray codes of Philips. Check the Philips Blu-Ray Player Remote Codes page here. What buttons do i press?! Cannot find the remote code for Vizio Blue Ray? Check the Vizio Blu-ray Remote Codes page here. Can you please let me know if there is a four digit code for the Toshiba BDX1500 Blu-Ray player? Thanks, John. Check the Toshiba Blu-Ray Player Remote Codes page. Need code for Sony 3d blue ray player. I have the universal remote. Check the SONY Blu-Ray Player Remote Codes page. Check the Seiki Support page and you can find the codes by submitting a support issue. I’m trying to find a code that works with a Sony BDP-S300. None so far have worked. Please help I need the code for the Samsung bd-h8500 smart dv3 bluray player. I have the one for all remote. Can anyone help? Try Samsung Blu-ray players Codes: 000 through 151. Also try an app for your phone such as the Android app Remote for Samsung TV/Blu-Ray. I have an LG network home theater LHB953. And GE universal remote. And I don’t know what code to use to set up my remote to the home system. I’ve tried a lot of codes and my remote locks them in but they don’t work with the system. Please help! I have a Samsung blu-ray disc player BD-D5500 and my remote is Total control 4. I need code! I have the RCA RCR003RWD remote; trying to get it to work with my Samsung Blu Ray player. Used all the Samsung codes above without luck. If it helps, the actual Samsung blu ray remote has (AA59-00600A) on it. I have a sanyo blu ray player and the onn universal remote I bought doesn’t have an option for a code of that brand. I have a Samsung smart blu Ray player is there a code to use remote Om my Hisense UHD TV. I have a GE remote control #RC24911-A and I’m trying to program my Phillips BluRay player #HTS3051BV/F7C. I’ve tried all the codes. It’s only 3 digits. I am trying to find a universal remote code for my Seiki Blu-ray Disc Player (SR4KP1). Thank you. I also have a RCA universal remote. The code 0199 works for power, play, on/off, f.f.,and rewind but I cannot use the arrows to go up ,down or side to side for my Netflix account. I am trying to update my Blu Ray (Panasonic). Had to buy a new remote because I couldn’t find the original. I bought an RCA universal remote. Now I can’t find the code….please help.